Flag adopted 12 December 1962, coat of arms adopted 16 December 1962. Why is the Nepali flag the only non-rectangular national flag? The flag of Nepal is the only national flag which is not rectangular, being based upon two separate pennants which belonged to rival branches of the Rana dynasty, which formerly ruled the country. The two pennants were first joined in the last century, but it was not adopted as the official flag until 1962, when a constitutional form of government was established. The charges are now said to represent the hope that Nepal itself will last as long as the sun and the moon. The style of these heavenly bodies was streamlined on December 16, 1962. The coat of arms still portrays these charges with facial features. Crimson is deemed the national color. Motto on their coat of arms: "The mother and the Mother Earth are more important than the heavenly kingdom." Alter (1986) Banderas y escudos del mundo (Flags and coats of arms of the world). Madrid: EASA (1986). The faces were removed in 1962, I believe. The other day I met a man who was from Nepal and he explained to me about the flag's meanings. The moon, he said, is supposed to represent quiet because Nepal is such a peaceful country and people are asleep during the night. And the sun is suppose to represent work because it is such a hard-working country and everyone is busy during the daytime. Interesting. The sun and the moon mean that Nepal will last as long as the two remain in the sky. The flag has been in use in Nepal for centuries, from the time of the Malla dynasty that preceded the Shahs and the Ranas. 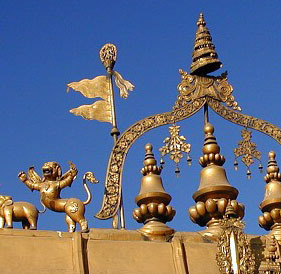 As an example, see this photo of the Golden Gate (1753 AD) which is ornamented with a metal Nepal flag. Such flags are installed at the doorways of many temples in Kathmandu; some have the sun and moon design and some don't. The two triangles symbolize the Himalayas and also stand for the two main religions in Nepal - Hinduism and Buddhism. The flag is actually a symbol of extreme faith. The shape of the current flag was determined at the very beginning of the history of modern Nepal, and the credit for it goes to King Prithvi Narayan Shah. Above the crescent moon in the top triangle are eight small triangles in what looks like a smaller version of the sun partially eclipsed by the moon. The moon has been used as the symbol of Elixir and is believed to give eternal life. Every religious ritual is done according to the waxing and waning of the moon. The moon even reflects the peaceful and friendly attitude of the Nepali people. The sun in the lower part has 12 triangles altogether. The sun is the heavenly symbol of fire. It is even the symbol of life because it provides the heat necessary for living beings. It soaks up the water and gives it back in the form of rain, making food production possible on earth. According to the Hindu religion, Sun is one of the Dev or Gods among five Gods or the Panchadev ("pancha" means five and "dev" means god). The history of the worship of the sun is connected with ancient Vedic rituals. Even the 12 signs of the zodiac and the 12 months are related to the movement of the sun. The sun is taken as the head of the planets and a symbol of the soul. Similarly, the moon is taken as the head of the asteroids and a symbol of the heart. The sun even symbolizes eternal light. The colors used in the flag also have religious and emotional significance. Red symbolizes closeness and blue symbolizes distance, whereas white symbolizes neutrality. Red is related to fire and blood, and blue is related to the vast sky and deep sea. Red is the symbol of extreme heat; blue is the symbol of extreme cold. It seems quite meaningful that the sun, the moon, and the blue and red colors are used together. Red symbolizes bravery. It shows that the Nepalese are brave by birth. It is even the symbol of good luck in Hinduism. Blue symbolizes knowledge, wisdom, honesty, tranquility, and peace. Red has the quality of arousing love, enthusiasm, and energy to the soul. It is even believed that red is the first color used by human beings. Red is used in the Nepali flag to reveal our brave history. The protocol manual for the London 2012 Olympics (Flags and Anthems Manual London 2012) provides recommendations for national flag designs. Each NOC was sent an image of the flag, including the PMS shades, for their approval by LOCOG. Once this was obtained, LOCOG produced a 60 x 90 cm version of the flag for further approval. So, while these specs may not be the official, government, version of each flag, they are certainly what the NOC believed the flag to be. For Nepal: PMS 186 red, 287 blue. The vertical flag is simply the horizontal version turned 90 degrees clockwise. The first reproduction of the Nepali flag found by M. Lupant is shown in a book published by Perceval Laundon in 1928 (Nepal, vol. 1, pp. 233-236, Constable, London). The flag was crimson with a green border. It was made of two superposed isoceles triangles. The two points could have symbolized the royalty and the Rana family. The moon symbolized the King and the sun symbolized the Rana family. Moon and Sun expressed the hope that the Nation shall live as long as them. The faces are both shown with ears and a symbol in the middle of the forehead (probably one of the coloured spots used by Hinduists, whose name I forget), and the face in the upper triangle has a small neck putting it above the moon. Here's little bit about Nepal flag. The national flag of Nepal is the only non-quadrangular national flag. The flag is a simplified combination of two single pennants that represent, for some, the mountains of Nepal while for others the Hindu flags. The flag was adopted, with the formation of a new constitutional government, on December 16, 1962. The individual pennants had been used for the last two centuries and the double pennant since the 19th century. See also discussion about the Kirat flag. Probably the answer is easier, if the question is asked the other way round: Why are all national flags (except for the Nepali one) rectangular? TThe pretty uniform shape of the national flag can be probably explained by the fact that the national flag has its origin in a limited area (Europe and Mediterranean), as ship flags. Certainly there had been different shapes in the early times, but rectangular clothes of an approximate proportion of between 1.5:1 and 2:1 seemed the most practical ones, so the countries "standardized" this shape. Afterwards the ship flags had been adapted for terrestrial use. National flags of countries outside Europe only developed after European national flags had standardized their shape, so they were imitating the rectangular shape as well as some of the symbolic elements (vertical/horizontal stripes, for instance). Older national symbols were transformed to the "European" flag shape, for instance in Ethiopia, where the originally separated red, yellow and green pennants were transformed into a horizontal triband of rectangular shape. Nepal retained the original shape of its flag (basically two pennants one above the other). The first origin of this flag is probably elusive. However, other flags in the Indian area also showed non-rectangular, often pennant-like shape, see in-princ.html#alpha. The Nepali flag is probably the only one surviving, something like a "living fossil". Usually living fossils survive in rather secluded areas, such as Nepal (not having coastal access, and being mountainous) or Switzerland (the same), still sticking to the square shape of its flags. The triangular shape reflects the historical shape of flags used by kingdoms on the Indian subcontinent. Even today the flags flown on the masts of temples in India are predominantly triangular. As far as I can find out the flag of Nepal will retain its current shape, and amongst national flags it is indeed unique. A pennant with its lower edge at right-angles to the hoist, is now obsolete in Western society, but was not unknown in medieval times when it was called a "pavon". Such a shape is, however, still seen in the East - witness the "dhvaja" of Hinduism - but the only other "double pavon" (a term introduced by the Editors of the DoV) I can think of - although there will doubtless be different examples - is the flag of the former Princely State of Dewas, India. Nepal has seen political turmoil for some time, the latest developments seeing the King hand over his powers to a parliamentarian government and the government signing a peace treaty with Maoist rebels. Apparently searching for a new national emblem has formed part of these developments. The front page of "The Rising Nepal" newspaper reported on December 18 that a new national emblem "incorporating national unity and people's sovereignty" has been adopted. According to the newspaper, the new emblem "reflects spirit of loktantra marked by inclusiveness and gender parity." The description of the emblem is as follows: "It is round in shape with national flag on the top of its centre encircled by rhododendron, the national flower. Inside the circle lies Mt. Everest, hill, map of Nepal and handshake of a man and a woman. Below the circle reads the Sanskrit verse 'janani janmbhumisch sworgadapi gariyasi' which means the 'mother and the motherland are greater than heaven'." Three artists are named as the people behind the new emblem: Nabindra Man Rajbhandari, Himalaya Gautam and Krishna Shrestha. It seems clear, then, that the national flag is not undergoing any changes. The coat of arms in use before 30 December 2006 (http://en.wikipedia.org/wiki/Image:Coat_of_arms_of_Nepal.png) consists of a white cow, a green pheasant (Himalayan Monal), two Gurkha soldiers (one carrying a kukri and a bow, and the other a rifle), peaks of the Himalayas, two crossed Nepalese flags and kukris, the footprints of Gorakhnath (the guardian deity of the Gurkhas) and the royal headdress. It also contained the same red scroll with the national motto. This coat of arms was preceded by the Emblem of Nepal. Red six-pointed star (like a Magen David, filled) bordered white and containing a black trident. national flag on the fin. The Royal Nepalese Army, Air Wing, was formed in the mid 1960's and became the Royal Nepal Air Force in July 1979 when it adopted the marking.